Overnight Sunday Night: Drizzle ends, clouds eventually partially clear. Lows in the 30s. Monday: A mix of sun and clouds, breezy. Highs in the 40s. Tuesday: Mostly sunny. Highs in the 30s to near 40. A burst of heavy snow has moved out to sea and into sections of Maine with a wintry mix making its way through over much of Southern New England for the exception of the Cape and Islands where it has changed over to rain. Most of us will see the transition from mixed precipitation to rain by this afternoon as temperatures rise and drier air filters in from the west. This system will move out quickly and by dinner time, most of us will be drying out though not including Northern New England where we will continue to get snow showers and light snow towards Maine. The wind will continue to impact the coastline and higher terrain, with gusts up to 40mph. Mostly cloudy skies and patchy fog possible with temperatures in the 30s tonight. Sunshine mixed with clouds returns Monday as well as spring-like temperatures when highs will soar into the upper 40s to near 50 degrees. The exception will be in the Northern New England mountains where upslope snow showers will continue on and off throughout the day. Tuesday and Wednesday are cooler with temperatures in the 30s to near 40 degrees, but the mercury will be on the rise late week with a chance to hit 60 on Friday! 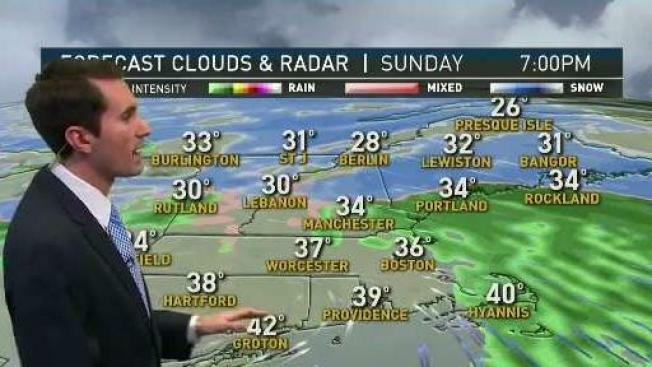 A storm system will come closer to New England to end the work week and with that mild air in place, it looks to be all rain. Right now the weekend looks great- quiet with seasonable highs just in time for Saint Patrick’s Day.